Nicholas has been chatting up a storm and there are some words and phrases he says that are just so sweet. I may be biased but I think he has the sweetest voice ever. So to make sure I remember these things I made this layout based on a Pagemaps sketch using mostly BG Offbeat with some American Crafts thickers. 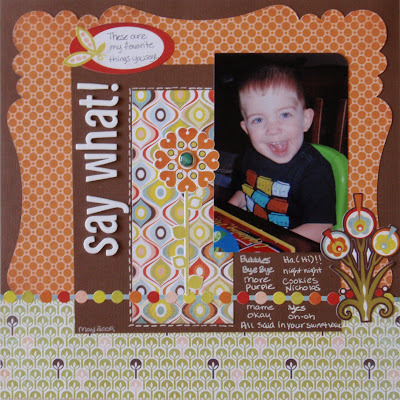 Journaling says: These are my favorite things you say: bubbles, bye-bye, more, purple, ma-me, okay, Ha (Hi)! !, night night, cookies, Nicholas, Yes, oh-oh. All said in your sweet voice. I love this layout!! Great title and design! Nicholas is a little doll! Glad to see someone documenting those important milestones of talking. I need to get on this! !